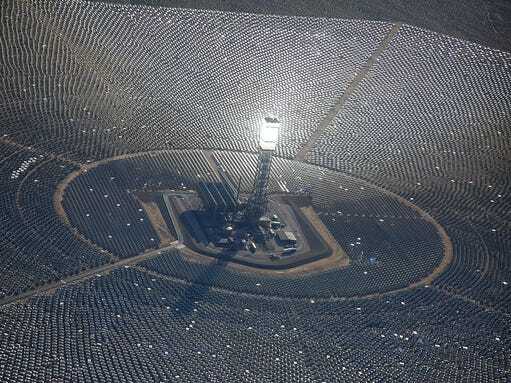 Seen from the air, the Ivanpah solar project is both breathtaking and terrifying. 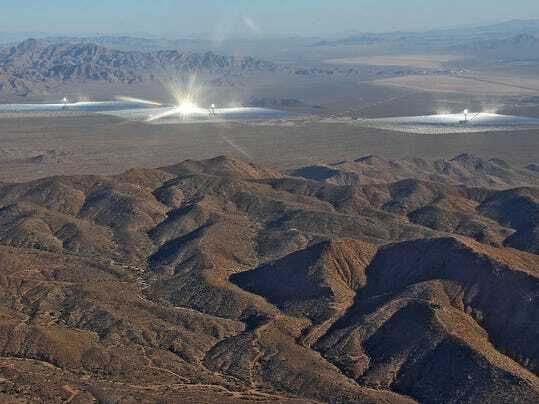 In a valley just north of Interstate 15, near the Nevada border, close to 350,000 mirrors reflect sunlight toward three massive towers, which glow impossibly bright as they convert that sunlight into energy. 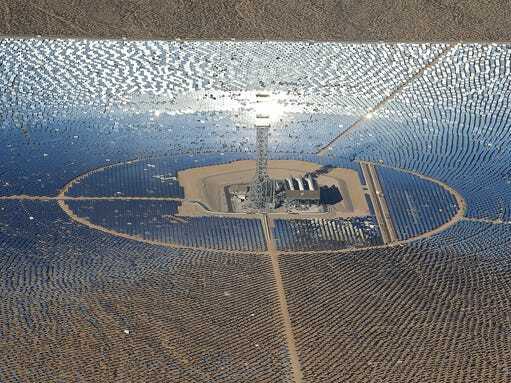 Ivanpah is the largest concentrated solar plant in the world. Unlike traditional solar photovoltaic panels — which convert sunlight directly into electricity — concentrated solar technology uses sunlight to heat water or another liquid, ultimately creating steam that can be used to turn turbines and generate electricity. Concentrated solar power is much more expensive than solar panels and wind turbines, but advocates say it has a major advantage over those technologies, particularly in California: the ability to store energy. As the state races to adopt renewable energy, one of its biggest challenges will be intermittency — the fact that most solar and wind plants only produce power when the sun is shining, or when the wind is blowing. "We bought a lot of really good wind and solar resources, but those resources alone can't operate the grid," said V. John White, executive director of the Center for Energy Efficiency and Renewable Technology, a leading renewable energy advocacy group based in Sacramento. Concentrated solar with storage could fill the gaps in intermittent renewable generation, limiting the need for carbon-emitting natural gas plants. But despite concentrated solar power's benefits, it has been hobbled by financial and environmental challenges — and nowhere have those problems been clearer than in Riverside County. Two concentrated solar projects — Palen and Rice, both of which would have been built in eastern Riverside County — have been dropped by their developers in the last few months, despite earning regulatory approval. At least two other concentrated solar proposals in the county have stalled or been abandoned over the last few years, with just one such project — NextEra's 250-megawatt Genesis plant — making it to completion. Concentrated solar plants cost much more to build than solar photovoltaic plants, and environmental groups have criticized "power tower" projects, like Ivanpah and Palen, for their potential to kill thousands of birds. Concentrated solar plants can also use hundreds of times more water than solar photovoltaic plants. Even some environmental groups, though, see a future for concentrated solar — if the wildlife impacts can be reduced. "A lot of it comes down to siting and where you put these projects," said Ileene Anderson, a senior scientist with the Center for Biological Diversity. "I think there are benefits to concentrating solar technologies with regards to storage, which is something we'll have to ramp up — filling the gaps to transition away from fossil fuels." With the price of traditional solar panels falling rapidly — largely driven by a surge in Chinese manufacturing — concentrated solar technology has been slow to take off. According to the federal Energy Information Administration, the United Statesgenerated just 926 gigawatt-hours from concentrated solar power last year, compared to 8,327 gigawatt-hours from solar photovoltaics. But concentrated solar development has intensified over the past year, with five large-scale projects expected to open by January. The Department of Energy noted in aglowing report in May that those projects could nearly quadruple the country's concentrated solar capacity. Among those projects is Crescent Dunes, which is being built in Nevada by Santa Monica-based SolarReserve. Set to come online in January, Crescent Dunes will be the county's first solar tower development to feature storage, with a capacity of 110 megawatts and the ability to store more than 10 hours of energy. SolarReserve CEO Kevin Smith said businesspeople and executives from more than 20 countries have visited the Crescent Dunes construction site in Tonopah, Nevada — many of them eager to find out when the project will come online. "Seven years ago, I didn't know Tonopah, Nevada existed. Now I'm talking with people in Saudi Arabia and Europe and Riyadh and Santiago, and everyone's asking about Tonopah," Smith said. "It's a key project, and it really will set the standard for solar energy with storage." The storage technology that will be used at Crescent Dunes is simple. Sunlight directed toward the top of a 540-foot tower will heat molten salt to more than 1,000 degrees Fahrenheit, and that liquid will then be transferred to a storage tank, where it will retain most of its heat. When electricity is needed, the molten salt will be used to heat water, creating steam that can be used to turn turbines and generate electricity. Not all concentrated solar developments use "power tower" technology. The Genesis project, which came online 75 miles east of Indio earlier this year, uses parabolic trough technology. Whereas solar tower projects direct sunlight at central collectors, solar trough projects use curved mirrors to direct sunlight at thin tubes running throughout the project. Those tubes contain oily fluids — which, again, are used to heat water, creating the steam that turns turbines and generates electricity. Abengoa Solar's 280-megawatt Solana project, which came online in Arizona late last year, pairs solar troughs with six hours of energy storage. Experts say Solana and Crescent Dunes are pivotal examples of how concentrated solar with storage can help reduce carbon emissions, by eliminating the need for natural gas-fired power plants to supplement intermittent wind and solar power. Concentrated solar could have its greatest impact in California, which has seen intermittent wind and solar generation skyrocket as utilities come close to meeting the state's 33 percent renewable energy mandate. Natural gas-fired power plants produce half as much carbon as coal-fired power plants, but as California works to meet its ambitious long-term climate goals, burning large quantities of natural gas is likely to become untenable. "There is no doubt you can make a power system run by continuing to have gas machines run and provide all the flexibility," said David Jacobowitz, senior product marketing manager for BrightSource Energy. "But people are starting to realize that that's something that probably has a finite lifetime, too." The recent surge is concentrated solar development, however, has come with a catch: Most of it hasn't involved energy storage. Ivanpah doesn't have storage, and neither do any of the other concentrated solar projects being developed in California. Once Crescent Dunes comes online in January, it will join Solana as the only concentrated solar plants with storage in the United States — and there aren't any others in development. It's no secret that concentrated solar power has been dragged down by its high costs, at least in the United States. According to Cory Honeyman, a solar analyst at the consulting firm GTM Research, no new contracts for concentrated solar plants have been signed in several years — a fact that "speaks volumes" about the technology's competitiveness, he said. As more concentrated solar plants come online, experts say, the technology will improve, bringing down costs. 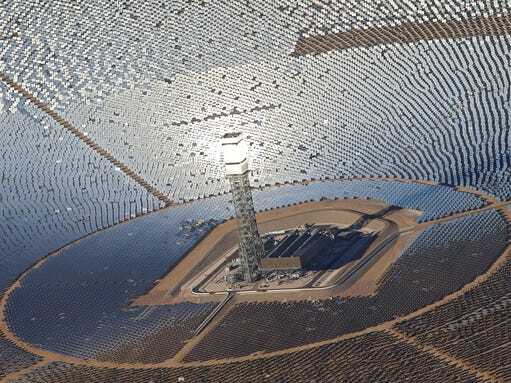 But in the meantime, executives at BrightSource — which is heavily invested in concentrated solar power — insist the market isn't properly valuing the benefits of concentrated solar with storage, particularly in California. "Several years ago, storage seemed — even to us — to be something that added risk to a project without adding sufficient value, and could drive up the cost," Jacobowitz said. "But the technology has changed, and we've had advantages that reflect that." Concentrated solar advocates have taken issue with California's "least-cost, best-fit" method for valuing renewable resources. Regulators, they say, have put too much emphasis on the "least cost" component — to the detriment of higher-cost resources like concentrated solar, which can nonetheless ease the transition away from fossil fuels. "While (concentrated solar) doesn't meet the definition of 'least cost,' there's some indication that it has a role to play as part of a 'best-fit' solution," White said. Concentrated solar development has also faced an obstacle common to all large-scale solar projects: the planned expiration of a federal tax credit. The 30 percent investment tax credit for renewable energy is slated to drop to 10 percent at the end of 2016, and only projects that are fully online by then can qualify. Investors have been hesitant to finance projects that won't come online by the end of 2016, fearing those projects won't be sufficiently profitable without the 30 percent tax credit. The impact of the expiring tax credit, Honeyman said, has hit concentrated solar harder than it's hit solar photovoltaics so far, because concentrated solar projects take longer to build. The tax credit's expiration is why SolarReserve has all but abandoned the 150-megawatt Rice project, which would have had energy storage. It's also why BrightSource and Abengoa dropped the 500-megawatt Palen project just two weeks after state regulators approved one of two proposed solar towers. Palen wouldn't have been built with energy storage, although its developers convincedthe California Energy Commission to approve the project — after the commission initially planned to reject it — based on the promise that it could eventually incorporate storage. Such was the allure of storage that even its potential inclusion — years or decades down the line — changed regulators' minds. "Whether the cost of (concentrated solar) and storage is equal to the value is not for me to know," White said. "But I do know that the grid would benefit greatly from having this capability added to the portfolio." Even if concentrated solar power gains a stronger economic foothold, it could still face serious environmental challenges. Power tower projects, in particular, have come under fire for killing huge numbers of migratory birds, with the Center for Biological Diversity labeling Ivanpah a "mega-trap" for birds and insects. The exact number of birds being killed at Ivanpah is hotly debated — BrightSource has emphasized that 321 birds were found dead during the first six months of this year, while some observers have pegged the annual death toll as high as 28,000. Many of those birds have died trying to fly through the intense radiation directed toward the project's towers, known as "solar flux." Whatever the number of deaths, avian mortality has become a hot-button issue for power towers. Environmental groups lobbied heavily against the Palen project, which would have fallen within a migratory bird pathway, and future power tower proposals are likely to face similar opposition — at least until effective mitigation measures are developed. Joe Desmond, BrightSource's senior vice president of marketing and government affairs, says he doesn't see bird deaths as a serious roadblock to future power tower development. "Time has shown that the facts have been on our side," he said. "Time and science and data all contribute to people getting comfortable that they understand particular impacts, and that they can develop appropriate mitigation strategies for those impacts." BrightSource officials have also argued that bird deaths at Ivanpah are being blown out of proportion, noting that cats, buildings and power lines kill somewhere between 2.5 and five billion birds each year. But Kim Delfino, director of California programs for Defenders of Wildlife, dismissed those comparisons, saying solar companies have a legal obligation to make sure environmental impacts are "analyzed, avoided, minimized and mitigated." "How many birds a cat kills is rather irrelevant when you're trying to assess the impacts of a specific project," she said. "That's like my 14-year-old telling me that everybody else does it, so it's OK if she does it." Solar troughs, Anderson said, pose smaller risks to birds because they don't create massive fields of solar flux. On the other hand, she added, solar troughs might be more dangerous to terrestrial species, because they require the underlying land to be scraped clear — which power tower projects do not. On the whole, traditional solar panels are less harmful to wildlife than concentrated solar projects, Anderson said — although all large-scale development in the desert will have some impacts. "From my organization's perspective, the best (solar) is on top of people's roofs, because it's close to where people use the energy," she said. Water use is also a growing concern for concentrated solar. Genesis and Palen were both permitted to use about 200 acre-feet of groundwater per year — about a thousand times more than First Solar's 550-megawatt Desert Sunlight project, which is permitted to use just 0.2 acre-feet per year once construction ends. Still, even 200 acre-feet — slightly more than 65 million gallons — is not an exorbitant amount of water, at least relative to other industrial and commercial water uses. Thetop 10 groundwater users in the Coachella Valley last year all consumed at least 2,000 acre-feet, and fossil fuel generation uses many times more water than concentrated solar generation, according to a 2012 report from River Network. "There are positives and negatives" about concentrated solar, Delfino said. "In my mind, the water issue's not as critical." While new concentrated solar development is coming to a standstill in the United States, it continues to thrive overseas. BrightSource and SolarReserve are actively pursuing projects in China, South Africa and the Middle East, according to executives from both companies. Of the 23 concentrated solar projects with storage that had come online by the end of last year, just one was in the United States, according to a report from the BrightSource-backed Concentrating Solar Power Alliance. Twenty-one of those projects were in Spain, which until last year offered a financial incentive specifically for concentrated solar. "What the grid operator in Spain has found is that the (concentrated solar) with storage was the most flexible and valuable resource they had on the system," White said. In the developing world, solar executives say, concentrated solar development is being driven by huge increases in electricity demand — coupled, in some countries, with a desire to ramp up renewable energy. "In a lot of the international markets, they don't really have a whole lot of choice — they need power on the grid, they need it reliably, and not just during the sunlight hours," Smith said. The United States, Smith added, has less of an imperative to adopt concentrated solar because of its vast natural gas reserves, which have been made much more accessible by hydraulic fracturing over the past decade. It's a double-edged sword — those natural gas reserves have helped the country transition to intermittent renewables, but in the long run, they could make abandoning fossil fuels more difficult. Many countries "don't have access to natural gas, they don't have access to the capital to build nuclear and other things," Smith said. "They're really looking at capacity to meet their base loads, and that's why storage is important."